It appears that Eminem will be involved with the Venom soundtrack. 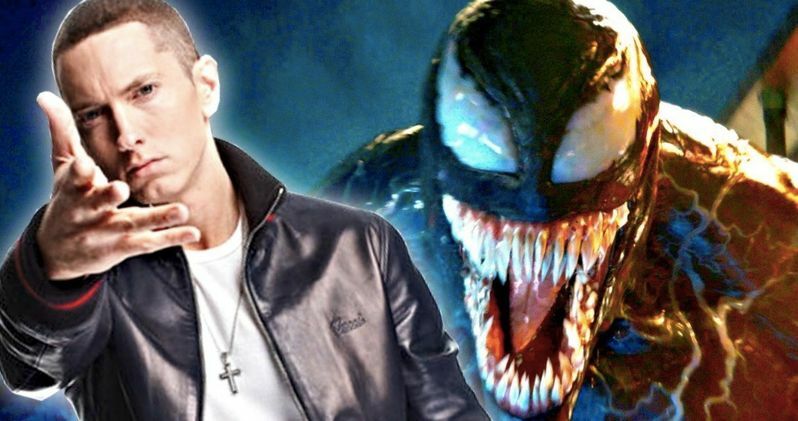 The rapper posted a quick tease of a new single, which includes an image of the symbiote and the movie's logo transformed with Eminem's trademark backwards "E." No other information is available at this time, but there are some words in the rap that mention Venom, so it's almost like Vanilla Ice's "Ninja Rap" from 1991's Teenage Mutant Ninja Turtles II: The Secret of the Ooze, where the Iceman raps about the turtles in the song. The Venom song seems more up-tempo with a dark feel to it, which is a bit of a departure from the sound of Eminem's last record, Revival. The word Venom is chanted and then the rapper comes in and says, "knock, knock, let the devil in," and then the preview starts to fade out. Soundtrack work is tough to pull off in a way that comes across as genuine. Ryan Coogler was able to pull Kendrick Lamar in to curate the soundtrack for Black Panther, which was a huge hit on its own. However, Eminem is a highly respected artist, and if anyone can make a song about Venom work, it's him. Speaking of Ryan Coogler, he tapped Ludwig Goransson to score Black Panther. Goransson was also brought on board by Ruben Fleischer to score Venom, which has led to some speculation that Donald Glover's Childish Gambino could make an appearance on the soundtrack as well. Goransson and Glover are long-time collaborators and have been working on a new Childish Gambino record for the last few months. Eminem has shied away from the spotlight over the last few years, and his recent Revival album was not well-received by fans. So, any new music from the rapper is going to be seen as a big deal right now. Already, the short little snippet offers a much different tone from Revival, which should have fans excited. In defense of his last record, Eminem agrees that there may have been too many songs, but admits that it takes people a few months or even years to catch up to what he's rhyming about. That shouldn't be a problem with the new Venom song. Venom is preparing to hit theaters on October 5th, which more than likely means that the soundtrack will be available on the same day. It's unclear who will be joining Eminem on this venture, but more news should be announced within the next few weeks, if not sooner. As for when Eminem wrote and recorded the song, that is also unknown. The rapper was probably given some unfinished footage to look at in order to get into the right frame of mind before crafting the tune. Venom star Tom Hardy once considered a career as a rapper, so maybe he spits some bars with Em on the track as well. You can check out the Venom soundtrack teaser below, thanks to Eminem's Twitter account.